Decisions equal success – and there are four decisions, in growing your business, that you must get right or risk leaving significant revenues, profits, and time on the table. 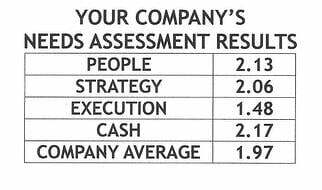 These four decisions are: People, Strategy, Execution, and Cash. Getting these Four Decisions provides a significant impact to your business. Our decision today, Strategy is strong topline revenue growth. Each of the strategy tools and resources we will discuss in this blog will enhance your businesses ability to produce greater revenue. 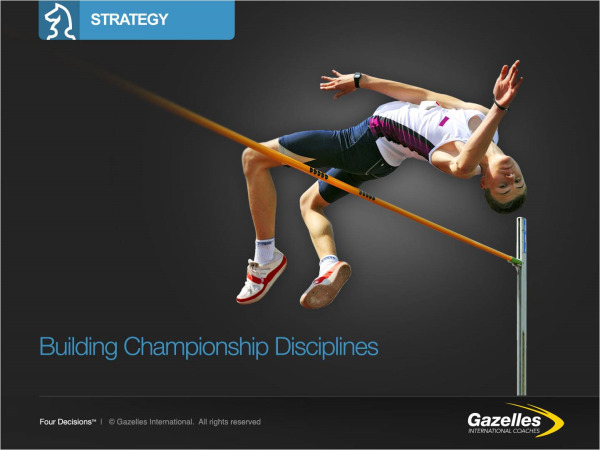 Let’s examine some of the Strategy tools and resources Positioning Systems and our fellow Gazelles coaches provide our customers to help them produce greater revenue. Strategy Statement: This is a specific tool that is for advanced customers. It’s not specifically in the Gazelles Tool kit and Positioning Systems developed this based on the Harvard Business Review article Can You Say What Your Strategy Is? by David J. Collis and Michael G. Rukstad. The article starts by asking the following two questions: Can you summarize your company’s strategy in 35 words or less? If so, would your colleagues put it the same way? When we asks this question in our public and private workshops, soliciting feedback from the participants, it’s amazing to discover who different and divergent the responses are within a specific company. If this question were researched I believe the results would be exactly what an Inc. Magazine survey which revealed 92% of CEOs believe their leadership teams agrees with and can communicate their strategy. In Reality: The same survey discovered: ONLY 2% OF THE LEADERSHIP TEAMS COULD! The article provides a wonderful example of Edward Jones Company’s strategy statement. Can You Say What Your Strategy Is identifies three critical components of a good strategy statement—objective, scope, and advantage—and believes that executives should be forced to be crystal clear about them. At Positioning Systems we’ve developed a presentation to walk our customers through each of these stages to develop a powerful 35 word Strategy Statement for their company. It’s proven invaluable to not only communicating the company’s strategy and gaining alignment throughout the company, but by succinctly and specifically crunching your strategy to 35 words it powerfully focuses a business on the clarity of how it differentiates itself in the market, where it’s going and how it plans to achieve it. In his book ‘Good to Great,’ Jim Collins studied the attributes of top performing companies – enduring top performing companies that had both great cultures AND delivered consistently strong financial performance for shareholders. An organization’s Core Purpose is their reason for being according to Jim Collins’ work and also answers the question “What difference are we making in the world?” It goes deeper than profit and job creation. Jim Collins, in his research and book “Good to Great,” discovered important information about Core Purpose from the “Great” Companies. Core Purpose often has its origin with the Founder. If your Founder is still in the business, or you have access to them, simply ask the question: “Why did you start the business, tell me your story?” and then listen carefully. Often you will find the Core Purpose in the this story! Other important questions to ask the leadership team include: Why do we exist? What would happen if we went away? and Why do I devote my creative energies here? Core Values are simply a handful of rules that your company has in place and lives by regularly – most companies have not stopped to clearly define their Core Values, but they do exist and they operate by them each day. The more clear and deliberate you are in your Core Values, the better for your culture and the easier the path from Good to Great. The simplicity of this perspective is astounding and illustrates the importance and worth of Core Values. Remember, Core Values are NOT who you want to be as an organization, THEY ARE WHO YOU ARE TODAY – too many companies post Core Values that are who they want to be, but then live quite differently from their Core Values. This is hypocrisy and will turn off team members and create a chasm of credibility between leadership and team members. Is this Core Value alive among your team today (can you identify the name of a team member that is living out each of your Core Values in an energetic and obvious manner)? Let’s use an example: Brandy Marsh is the president of Area Floors, a Pacific Northwest flooring company serving the residential home market. Brandy’s leadership team attended a 2-day MRH workshop, built a One-Page Plan, and over a 2-year period seriously applied the 10 Rockefeller Habits on the checklist. She had a long-term, top-performing sales representative that attended the roll out of the Core Values, but consistently acted contrary to one of Core Values: “Ownership Mentality,” which meant everyone had the responsibility and authority to think like an owner and make decisions based on an owner’s perspective – long-term gain not just short term AND spend money like it was their own. The sales rep was warned once for blatantly violating the Core Values after being trained on them and then was terminated for once again not taking the Core Values seriously through improper behavior and inappropriate use of resources. The sales rep was shocked that Area Floors would be so serious about their use of Core Values – it sent a message to everyone on the team of the importance of character and the use of Core Values – for the good of everyone. We have a lot of ground to cover with Strategy to help business achieve significant top line revenue growth. Still ahead for Strategy: Core Competencies, SWOT, SWT, Words You Own, Seven Strata of Strategy, WHO: Your Core Customer, Brand Promise, Core Processes, Profit Per X, Actions to Live By, Catalytic Mechanism, X Factor, 3-5 Year Plan and the Innovation Window. We’re looking at 2-3 more blogs to cover these. Monday I’ll be back with more on Strategy.